Parklets are a new type of public space that has emerged in the last decade. They involve the reallocation of road space, and the creation of a mini park or gathering area in the place of parking spaces. Generally, however, the transformation leaves the the underlying asphalt or concreate road “base” intact – giving parklets a less permanent quality than other types of public space. The first parklets were built in 2010 in San Francisco, and the concept quickly spread to other cities, with Vancouver installing it’s first – Parallel Park, at Main and East 14th Ave – in 2011. There are now 10 located in neighbourhoods around the city – including three new ones opening in 2018 (list below). Typically, parklets transform street parking (usually 2-3 spaces), reclaiming an area that was used to store private automobiles and turning it into a ‘mini park.’ This usually involves the addition of a platform structure, seating, tables, planters and landscaping, artistic features, and clever design. Each parklet is unique, and many employ a range of different materials and construction techniques. They also almost always involve a lot of collaboration, as local architects, designers, business owners, city officials, and community members work together to make the parklet a reality. Because of this, parklets are also an interesting model of public space – one that (at least in Vancouver) is primarily designed and funded by private entities – usually adjacent businesses, along with local designers. Many of them have also included an active crowd-funding component. Unlike patios, which can be enclosed and are essentially a privatization of public space, parklets are intended to remain open and accessible to everyone. You don’t need to patronize adjacent businesses to enjoy these spaces (although, hey, if you do want to ‘vote with your wallet’ and support public-space friendly businesses, that’s definitely something we encourage!). Davie Street is seeing a significant transformation this summer with the addition of the Pride Place Parklet and two other large sidewalk patios. Installed in July 2018, in front of Los Amigos Taqueria, the new parklet provides attractive wooden benches and tables, ringed with a landscaped edge. Designed to celebrate the local LGTBQ2S community, the parklet design is accented with the colours of the rainbow. It’s also located adjacent to the upcoming curbside patio at Stepho’s restaurant – creating a continuous, 20 metre (70 ft) transformation of the street. Kenneth Chan. Massive parklet coming to Davie Street in Vancouver’s West End. Daily Hive, June 29, 2018. Vancouver’s first parklet! Located just off of Main Street in front of the JJ Bean Cafe. The parklet was designed by Travis Martin, and installed in 2011. It has recently been redesigned as part of a larger initiative to transform this block of E 14th into a neighbourhood plaza. The parklet is the first to be paired with a bike corral and modular decking and railings with more features anticipated. Located in front of Café Crepe, this popular seating area was installed in July 2012. In addition to providing a nice place to sit down in one of the West End’s key shopping streets, Urban Pasture also helps to ease congestion on a narrower part of the sidewalk. Curving wooden benches are complemented by planters and landscaping. As the City’s website notes: “a great place to sit and people-watch the throngs of Robson Street shoppers.” The project was a collaboration between collaboration between Imu Chan of FSOARK Architect, David O’Regan and Jane Vorbrodt of KUNO Architecture. Installed in May 2014, this attractive gathering area is situated next to some of the neighbourhood’s best chocolate, pastries, coffee and boutiques. The parklet features intriguing triangular “dipped” benches that help the parklet to fit seamlessly next to the sidewalk, as well as an innovative “bike bar” design that allows cyclists to pull up, take a break, and share in the experience. The side street location is nicely shaded, making things more comfortable on hot summer days. Designed by PWL Architects, in collaboration with Chocolaterie de la Nouvelle France, Tradeworks, and Holland Landscapers. Justin Giovannetti. 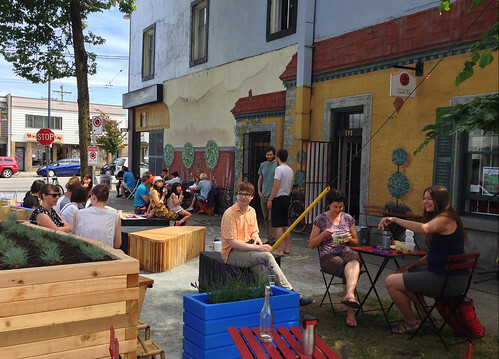 Parklet to occupy two parking spaces in Vancouver’s French Quarter. The Globe and Mail, February 11, 2014. Cameron Barker. The French Quarter Parklet — Vancouver’s newest parklet melts cycling and chocolate together at last! Spacing, January 7, 2014. Located in front of Prado Café, the steel and wood structure of the Commercial Drive Parklet has tables, benches, and some of the best people-watching opportunities in East Van. Designed by local designer Julian Thomas, and the VPSN’s own Stewart Burgess, it was built and installed between July and October 2014, and was supported through an active crowd-funding program. Olivia Fellows. Vancouver’s New Make It Yourself Parks. The Tyee, July 23, 2014. Yvonne Zacharias. ‘Parklet’ a new addition on Vancouver’s urban landscape. Vancouver Sun, August 16, 2014.
Who says you can’t build a parklet on a sloping road! The angular benches of this terraced parklet make for a comfortable place to enjoy an ice cream from Rain or Shine Ice Cream, or just kick back and enjoy the Kitsilano vibe. Installed in summer 2015. Stools, tables, and a terraced wall of planters helps to create a little ‘nook’ in this hip part of Main Street. There’s even a little “grass” perch with beach chairs and an umbrella! Located in front of Meet on Main, and installed in June 2017. Panelled in warm wood, the Fraserhood parklet has an especially cozy feel to it. Designed by Place Architects and located in front of Pizza Carano . Installed in July 2017. A popular parklet in this south Vancouver neighbourhood, this parklet had its grand opening in September 2012. Sadly, it’s popularity seems to have made it a victim of its own success, it was removed in 2017 owing to maintenance issues.